A few weeks ago was re-introduced to apparel and fashion retail analytics trends. Here came upon a broad look at recent trends in the area. In Smartdatacollective. Bernard Marr in Forbes on toy assistant capabilities aimed at children. Like the very successful adult assistants, these are ever listening, and can gather data to be used with Big Data, which may create regulatory issues. In the CACM: From IEEE Spectrum. 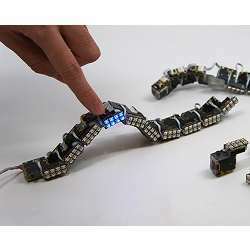 A modular robotic chain can be what you want it to. In particular interesting to see non humaoid robotic forms for tasks. An alternate form of biomimicry.